The agedashi tofu at Ken's Sushi. If you're reading this article, there's a good chance you're interested in finding some good Japanese food. Now, allow me to tell you about this little gem I've experienced and hopefully tempt you to make the trip to this little known suburb of Sydney. From its unassuming location at this equally unassuming suburb, Ken's Sushi is Bexley North's best kept secret. It also just so happens that it's one of the most delicious, authentic sushi restaurants I have ever tried. I even have it on good authority (from a veteran Japanese ex-pat) that it's the best sushi outside of Japan! So it sounds like I've built this place up a lot, but I promise to those who want to venture out to the St George area that the trip will definitely be worth it. We always start our journey with a fragrant pot of Japanese green tea while pouring over the interesting but not too overwhelming menu. Ken's make an array of Japanese dishes from steamed gyoza to the freshest most succulent and colourful sashimi platters. 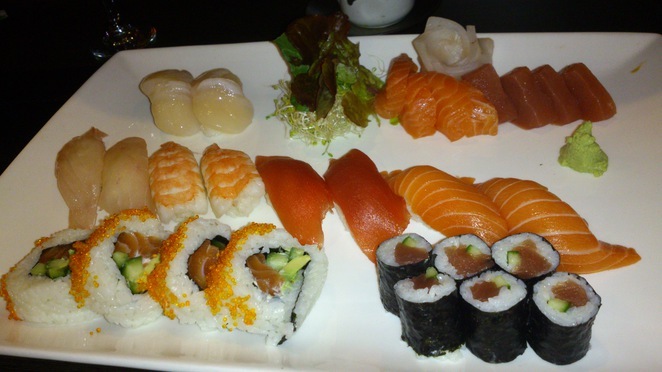 A sushi and sashimi platter at Ken's Sushi. In fact the sashimi is so fresh, succulent and buttery that you may forget you're actually eating raw fish. It's so good that I've even managed to convert a couple of non-raw fish eating friends over to the dark side. The tempura at Ken's is also excellent. You can choose from a vegetable, combination or prawn tempura. Word of warning after eating Ken's tempura...don't try this at home it just won't live up to your expectations! I've saved the best for last. The agedashi tofu is a personal favourite of mine. This traditional silken tofu dish is served in a bowl with the most delicious broth that is sweet, tangy, sour and salty all at once. Tofu lovers will love the wonderful balance of flavours that are a perfect match to the hot silken tofu portions. Now if you've left room for dessert (something I'm not too good at doing) then you must try the green tea or black sesame ice cream. I admit I was sceptical at first and thought they sounded rather odd but am now convinced. One minor criticism is the order the food is served. Be prepared to get your entrees and mains in the reverse order. At first we found this a little annoying but now we just shrug our shoulders and just go with it since it's all delicious anyway. Given the excellent food standard it's little wonder that Ken's has won several local business awards for a few years running. The restaurant is small and books out quickly so booking in advance is a must. It can also get quite loud and is certainly not the place for lengthy dinner conversations. If that's not your cup of tea then Ken's also offer take away. I'd be lying if I said there was anything else as amazing to do at Bexley North or immediate surrounds but with food this good you won't even notice the not so glamorous location. Cost: $10 and up its excellent value and very generous portions. The tempura and tofu dishes look excellent. 4) Art of Cakes bakery does beautiful meat pies, pastry and cakes. The two Thai restaurants are quite good too. If you have lunch there, then the perfect complement is coffee at Shaw St Espresso after (96% rating on urbanspoon).